According to the most recent figures, the UK had a PPP-adjusted GDP per capita of roughly $37,000 dollars. The researchers find suggestive evidence that this happiness dip in the wealthiest countries is because more money creates higher aspirations, leading to disappointment and a drop in life satisfaction if those aspirations are not met. Dr Proto said: “Whether wealth can buy a country’s happiness is a major question for governments. Many policy-makers, including in the UK, are interested in official measures of national well-being. “In our study we see evidence that this is down to changes in the aspiration levels of people living in the richest countries. “As countries get richer, higher levels of GDP lead to higher aspiration. There is a sense of keeping up with the Joneses as people see wealth and opportunity all around them and aspire to having more. 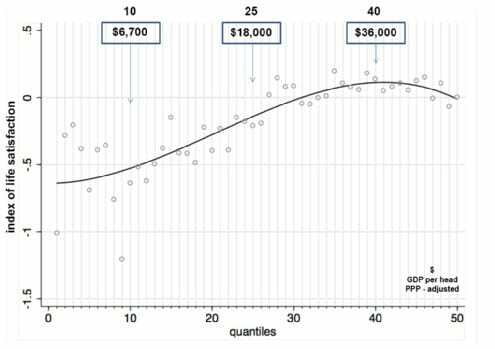 “But this aspiration gap – the difference between actual income and the income we would like – eats away at life satisfaction levels. April 1, 2019 - Does money buy happiness? What I learned about success from starting my own business LaddersIt's time to rebrand the concept of success as something holistic, heartfelt, and purposeful. By doing so, you can experience radical levels of happiness. April 19, 2019 - Moto G7 Review (All 3 Models): Which Moto G is Best? WIREDWe review the Motorola Moto G7, Moto G7 Power, and Moto G7 Play, three good reasons to consider a cheaper phone this year. April 5, 2019 - Tash Sultana Shares New Single, "Can't Buy Happiness" :: Music :: News :: Tash Sultana :: Paste Paste MagazineThe feel-good single comes just in time for the start of the singer's next tour. March 28, 2019 - When it comes to love money can buy happiness if you spend it the right way Starts at 60"Crying into satin sheets after an hour or so in one's 'rose-petalled' spa bath, beats a dip in the local council pool and weeping into polyester bedding, any day."